Back in the day of long sizzling summer, when our toes were hungry for ultra violet and our knees became a shade darker- we had mega picnics, one at Henley Royal Regatta and secret garden parties with champagne on tap. To top it off, we won a holiday to Croatia! It has been great. 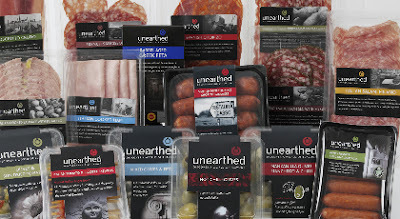 One morning, we were sent a whole box of Unearthed goodies because we had tweeted how wonderful their Parma and Serrano ham tastes. For foodies, something like this is like being in seventh heaven. We got to play around with the ingredients and simply just enjoyed them too. One thing lead to another and we were asked to host a special charity dinner party by Unearthed, using Unearthed products (any way we see fit) to raise money and awareness for the humanitarian organization - Action Against Hunger. (wow – what an honour). Back in September, culinary luminaries such as Raymond Blanc, Marcus Wareing, Francesco Mazzei, Giorgio Locatelli, Vivek Singh, Cyrus Todiwala, Jun Tanaka, Mickael Weiss, Oliver Rowe and Tristan Welch came together to launch Fight Hunger Eat Out - the UK’s biggest foodie fundraising campaign - to help fight child hunger in some of the world’s poorest countries. "while unearthed was born out of the enjoyment of food and flavours we’re also aware that for many people in this world, food remains a worry and a necessity in short supply, rather than a joy. We share Action Against Hunger's vision of a world without hunger and are proud to be the first National Ambassador Brand of their latest foodie initiative. The charity's work has begun to inspire our team already and we look forward to making food less of a concern and more of a pleasure for others in future." As usual, we are spinning with excitement! The cold is starting to kick in and its time for more dinner parties – we hope that many of our friends, readers, followers and guests will be inspired to host their own dinners to raise money and create awareness for Action Against Hunger to help build, maintain communities and health care in places like Zambia where Unearthed are supporting long term solutions to hunger. We will be reporting back. If you have any questions you would like to ask Unearthed or Action Against Hunger, please use the comment form and we will be sure to ask them for you. Thank you to Wild Card PR for the opportunity to do something very worth while and meaningful.